The much anticipated Constantinople hardfork of Ethereum was initially planned for the middle of January, however a serious bug was discovered shortly before the time of the fork, so it was postponed. The new date for for Ethereum’s latest network hardfork system upgrade is around 27-28 February (end of the month) or more specifically at block number 7,280,000 (200,000 blocks later than the originally planed block). The hardfork will be in two parts, the first one will include all five EIPs (Ethereum Improvement Proposals) including the problematic EIP 1283, that was the reason to postpone the fork initially, and the second part will be used to remove the problematic EIP 1283. So after the Constantinople and Petersburg hardfork (the two parts we are talking about) the Ethereum network will have the following 4 EIPs active – 145, 1014, 1052 and 1234. The improvements to the Ethereum network that the new hardfork will bring are numerous and they focus on improving salability, speed and efficiency of the blockchain. There is however a change that is also important to the economics of the Ethereum network and one that is especially important for miners. EIP 1234 is going to adjust the block reward, so after the fork miners will be getting just 2 ETH coins per block instead of the 3 ETH that they are getting at the moment. There isn’t much needed from you to do in order to be ready for the hardfork if you are using or mining Ether, just make sure you update any local wallet or client that you might be running. Also make sure to not make any transactions around the time of the hardfork in order to avoid any possible issues with delayed transactions and lost coins, though normally such problems are not very likely. The Ethereum (ETH) network will be undergoing a planned hard fork at block number 4.37 Million (4,370,000), which will likely occur between 12:00 UTC and 13:00 UTC on Monday, October 16, 2017. Ethereum users should update to the latest version of the Ethereum wallet/Mist if they are using it as well as any of the Ethereum clients – Geth, Parity or Harmony prior to the hard fork in order to be ready. Ethereum websites and mobile applications that allow you to store ether and/or make transactions are running their own Ethereum client infrastructure to facilitate their services and they should be doing the update as well in order to support he hard fork as well. A hard fork is a change to the underlying Ethereum protocol, creating new rules to improve the system. The protocol changes are activated at a specific block number. All Ethereum clients need to upgrade, otherwise they will be stuck on an incompatible chain following the old rules. Metropolis is a planned Ethereum development phase that includes two hard forks: Byzantium and Constantinople. 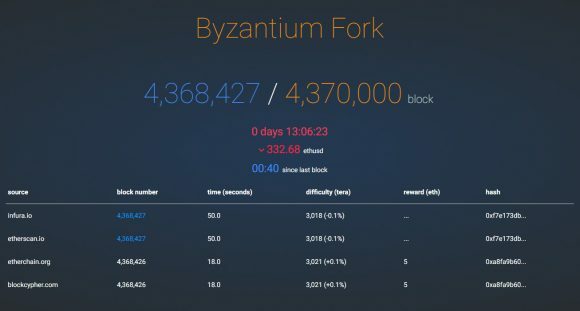 Byzantium is occurring at block number 4.37M (the hard fork happening tomorrow), while the second part – Constantinople does not currently have a release date, but is expected to happen some time in 2018. 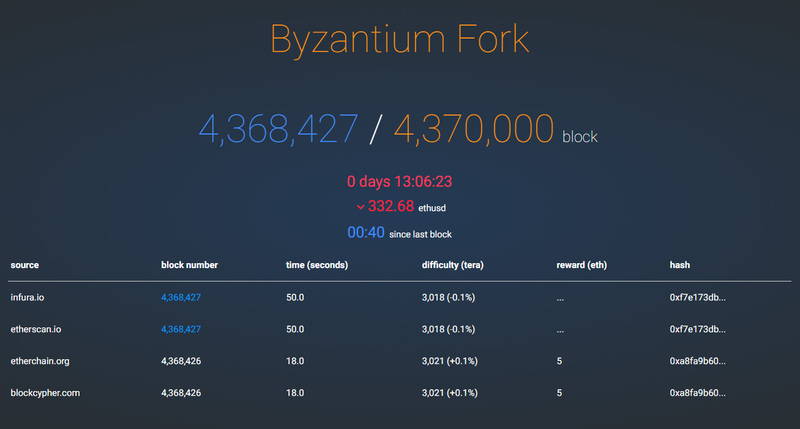 Update: The hardfork has been successful, the new block reward is 3 ETH (down from 5), but also the effective block time and difficulty have pretty much halved, so in the end miners should still be able to get a better profit at the moment compared to before the fork. If you remember last month we have warned that a possible Ethereum Hashrate Drop for Radeon RX400/RX500 GPUs is Incoming. The slow decrease of mining hashrate for Ethereum (ETH) on AMD Polaris-based GPUs was a bit puzzling as it was actually not related to the video memory, so 4GB and 8GB models were affected. Do note that at some point though cards with 4GB video memory might still start dropping in terms of mining performance anyway as the DAG size starts getting close to the amount of video memory available. 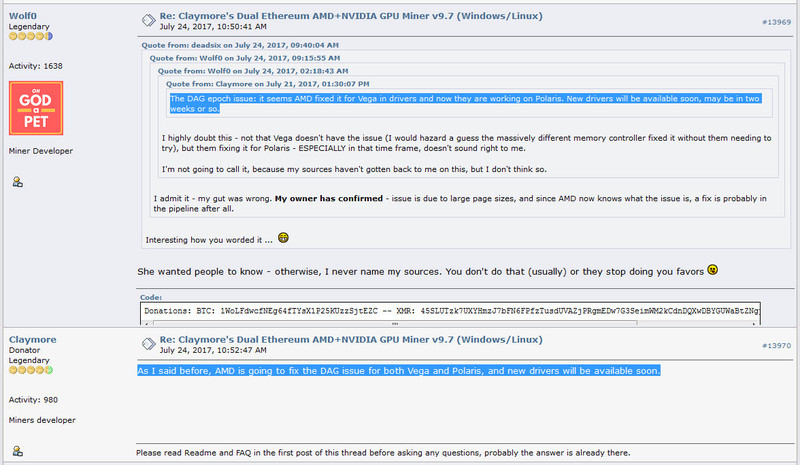 It turns out that AMD may actually be working on a driver fix to resolve the problem according to information published by Claymore on the Bitcointalk forum. Apparently the upcoming AMD Vega was also affected by the same problem, though it has been already resolved with driver fix and in two weeks or so a fix for Polaris may be release via a driver update as well. Hopefully a driver update that will not be WHQL and allow the use on AMD GPUs with modified video BIOSes as most AMD Polaris-based Ethereum GPU mining rigs are using modified memory straps for better performance. So most likely the new AMD Vega GPUs will not turn out to be a great choice for mining, though who knows… people are using GTX 1080 Ti’s at 250W TDP or even more with some OC for mining and are happy with the results. Even though it might not be great for mining Ethereum, the new AMD Vega, just like with GTX 1080 Ti, might still end up a good solution for Equihash or any other popular altcoin algorithm for example.